The NemaVision NV-HMI Range of Flat Panel PCs has had a whopping upgrade with 16 new configuration options. On the display front the user is spoilt for choice with 10 of the 16 models offering wide screen aspect ratio as an alternative to the traditional 4:3. A wealth of display sizes are available from 8.0” through 12.1”, 15.0” and 17.0” in the 4:3 Aspect Ratio and 10.1” through 15.6”, 18.5” to 21.5” in wide screen. All units utilise LED backlit displays and offer capacitive touch screen support as an option. A similar wealth of processor options, all with 64-bit support deliver across the range performance. Compare the entry level 1.86 GHz Dual Core Intel Atom D2550 with a 644 Benchmark to the 487 Benchmark of the Pentium IV 3.46GHz from 10 years ago and you start to get a feel for the processing power of these low end CPUs. And that’s just the start, the NV-HMI-800 Series uses the multicore ‘System on Chip’ (SoC) technology built on the Silvermont architecture from Intel’s powerful processor family for both mobile and desktop devices. Formerly known as Bay Trail the extremely fast 1.83GHz Quad Core Celeron N2930 using Burst Technology to provide and effective 2.16GHz weighs in with a Benchmark of 1691, compare this with the puny 311 benchmark of a 3.20GHz Celeron D352 from 2005 – nearly five and a half times faster! Plus if you think you need more overall power a Quad Core 1.91GHz E3845 is also available as an option. The top of the range model CPU wise is the NV-HMI-900 Series with the Intel i3 4th Gen 1.70GHz 4010U Processor offering a 2440 Benchmark from a Dual Core processor. Memory options are 4GB of DDR3 for the Atom D2550 based NV-HMI-700 and i3 4010U based 900 Series and 2GB of DDR3 for the N2930/N3845 based NV-HMI-800 models. 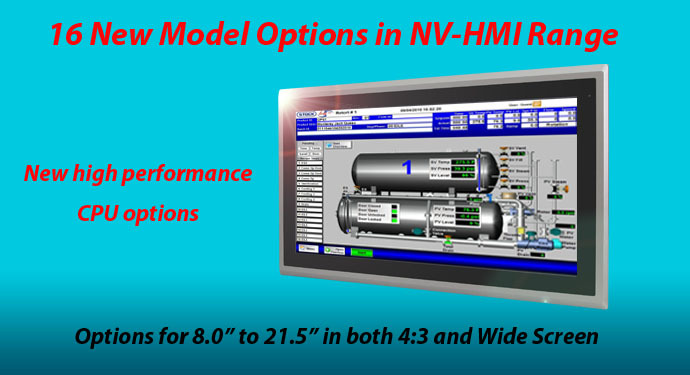 The NV-HMI Series now spans a really useful range in terms of processing power and provides an ideal choice for OEMs requiring multiple hardware options for machine control applications within the same family of industrial computers. For more information please follow this link to our product pages..